The Avatar, formed initially when Wan permanently fused with Raava during the Harmonic Convergence of 9,829 BG, is the human embodiment of light and peace through the connection with the Avatar Spirit. As the only physical being with the ability to bend all four elements, it is considered the Avatar's duty to master the four bending arts and use that power to keep balance among the four nations of the world, as well as between mankind and spirits. Upon death, the Avatar Spirit is reincarnated into the next nation, dictated by the cyclic order: fire, air, water, and earth. Mirroring the order in which the first Avatar, Wan, learned the elements, this is also the traditional order in which any one incarnation is to master the elements, beginning with the bending art of the Avatar's birth nation. The reincarnation cycle can only be broken if the Avatar is killed while in the Avatar State, Raava is removed from the Avatar and destroyed, or the Avatar Spirit is compromised by a spiritual infection. As part spirit, the Avatar possesses an innate connection to the Spirit World and used it to be the bridge between the two worlds in order to keep peace between them and ensure harmony. The Avatar is also capable of recalling events from past lives by connecting with the memories of a previous Avatar. Each nation has a method of recognizing the new Avatar. Among the Air Nomads, this involved presenting infants with a selection of toys and watching for a child that selected the exact four that had belonged to past Avatars, called the Avatar relics. Traditionally, the child is told of his identity as the Avatar on his sixteenth birthday. 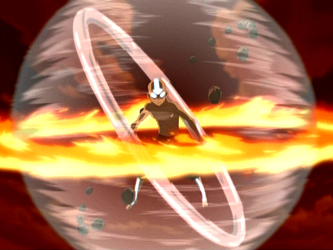 The Avatar also possesses the ability to bend energy itself, although very few Avatars have learned this technique, and even fewer have used it. Upon mastering control of the Avatar State, after having learned to bend the four elements, an Avatar is referred to as "fully realized". The Avatar Cycle is based on the passage of the four seasons, which coincides with the order in which Wan first learned the elements; fire related to summer, air to autumn, water to winter, and earth to spring. When an Avatar dies, the next Avatar will be born into the next nation in the Avatar Cycle. For example, an Air Nomad Avatar, would be reincarnated as a Water Tribe Avatar, followed by an Earth Kingdom Avatar, and then a Fire Nation Avatar, before going back to air. The Avatar Cycle also determines the order in which each Avatar must learn the four bending disciplines. The nation into which the Avatar is born identifies the first element that is to be mastered, often prior to the bender being revealed as the Avatar. For instance, an Avatar born into the Water Tribes first learns waterbending, before attempting to master the three remaining bending disciplines in the order of the cycle; earthbending, firebending, and finally airbending. Each Avatar has a particular element with which a low affinity is established, dictated by the personality of that Avatar. This element can be difficult to learn, sometimes proving impossible to control until faced with a situation in which the Avatar is forced to reach within and manifest the power. Although it is often the opposing element to the one of the Avatar's birth nation, this is not always the case. The Avatar is capable of bending more than one element simultaneously, usually two may be used at the same time but upon reaching the Avatar State, it is possible to bend all four at once. The Avatar's most powerful bending mechanism is the elemtal sphere, a skill where the Avatar first surrounds themself in a sphere of air, before calling on the remaining three elements and attaching them round the sphere, swirling constantly. These can all be used for offense and defense and are considered the Avatar's ultimate weapon. The elemental sphere is also used to subdue enemies, especially strong spirits, such as Vaatu. Due to the connection with the Avatar Spirit, the Avatar can call on past lives for wisdom and guidance. A previous incarnation of the Avatar can manifest through the current Avatar by possessing the body of the current incarnation. The summoned past Avatar will temporarily replace the appearance and abilities of the current incarnation. Projection allows the current Avatar to call forth an apparition of a previous incarnation, making a direct conversation possible. The Avatar can also recall memories from a past life. This can be done directly through deliberate meditation in order to connect with a specific Avatar. This can also be done subconsciously when in the presence of people or objects that were important to a previous Avatar, or things like statues of the Avatar. The strongest and most powerful ability that the Avatar can invoke is the Avatar State. It was created when Wan permanently bonded with Raava by touching the energy coming through the spirit portal during the Harmonic Convergence in 9,829 BG. It allows the Avatar to channel vast cosmic energies and the knowledge of previous Avatars, allowing for the ability to perform especially powerful and extraordinary bending feats. The Avatar may unconsciously enter the State in response to perception of mortal danger, utilizing the State as a defense mechanism, or emotional distress. While in the State, the Avatar has access to bending techniques that may have not yet been learned, but has no conscious control over the resulting actions, which can cause great collateral damage. An Avatar with full mastery of the Avatar State has conscious control over the State and can enter and exit it at will. The eyes of an Avatar with complete mastery will glow momentarily, rather than continuously. While in the Avatar State, the Avatar's eyes glow, as do any markings following chi paths along the body, such as Air Nomad tattoos; however, if the body has received an injury deeper than the tattoos, that specific area will not glow in the State. The white glow is the combination of all the Avatar's past lives, focusing their energy through a single body. When the Avatar speaks in the Avatar State, their voice is matched along with that of Raava's. It is possible for an Avatar to control the Avatar State, but this requires great spiritual discipline and concentration. More often, the Avatar State is unwillingly activated by danger or emotional turmoil and can be difficult to come out of in the Avatar is particularly emotional at the time. When in complete control of the Avatar State, an Avatar's eyes glow momentarily, rather than continuously. Entering the Avatar State also seems to nullify the effects of Bloodbending. When the State works continuously, the Avatar's eyes, and tattoos in the case of an Air Nomad Avatar, glow white constantly, and the spirits of the past Avatars actively channel their energy, skills, and knowledge through the body of the current Avatar, heavily augmenting the current incarnation's bending abilities. The State works this way almost exclusively when it is triggered as an instinctive, unconscious reaction, a 'defense mechanism' for when an Avatar's physical capabilities would be insufficient to confront the current threat, or in situations of extreme emotion, specifically rage and sorrow. So it may be more accurate to describe the State being used this way as 'reflexively' rather than 'continuously'. When the State is triggered this way the combined spirits of the past Avatars seem to take control of the Avatar's body and voice, thus the current Avatar has little to no control over the performed actions and may retain little to no memory of what happened, though this is not always the case. When the State is used non-continuously, the Avatar's eyes, and tattoos in the case of an Air Nomad Avatar, glow momentarily, and during that time the current Avatar stores the knowledge and energy needed so that it can be released once exiting the State, taking only the power needed for a specific task. This reduces the danger of being killed in the Avatar State and enables a more willful, controlled use of the Avatar State's power. This can only be done by an Avatar who has mastered the State as it is a conscious use rather than an instinctual response. Mastery of this technique is part of what distinguishes an Avatar as "fully realized". The Avatar State also allows an Avatar to join with certain spirits. This was demonstrated when Aang entered the Avatar State in order to aid the frantic Ocean Spirit. Both Aang in his Avatar State and the Ocean Spirit combined their abilities to defend the Northern Water Tribe after all waterbenders were rendered defenseless. While the Avatar is all but invincible in the Avatar State, having access to the bending experiences of all preceding Avatars, there is one grave weakness: while in effect, every Avatar is present in the physical world while the current Avatar is in the Avatar State. If the Avatar were to be killed while in the Avatar State, the cycle would permanently break and the Avatar would cease to exist. Another downside to the Avatar State is the considerable mental strain it can cause to less experienced Avatars. Furthermore, use of the State, at least in extraordinary circumstances, can place such a large physical strain on an Avatar's body such that their life span can be affected.